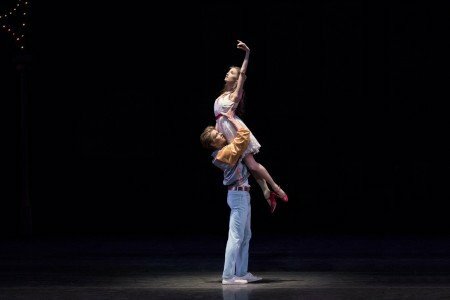 New York City Ballet’s Jerome Robbins 100 Celebration, which began with the Tribute program on May 3 (which was previously reviewed), concluded yesterday afternoon after presenting five distinct programs devoted to his ballet, spread over three weeks. 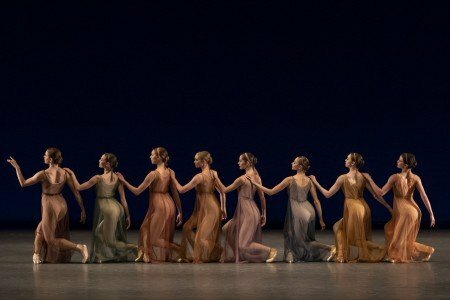 The three additional programs I was able to see included a trio of the most eagerly awaited revivals: Dybbuk and Les Noces, which have been absent from NYCB’s regular seasonal repertory far too long, and The Goldberg Variations, which is presented somewhat less infrequently, but not often enough. The Goldberg Variations is an unqualified masterpiece. Les Noces is simply astonishing, and was perfectly cast. Dybbuk is more difficult to like because it’s an example of Robbins’s more cerebral ballets, but it’s a significant work of ballet art. I’ll discuss each of these ballets first, and then return to the other pieces I saw in program order. (taken from the 4th Ring of the David H. Koch Theater). On the surface, the ballet is a story of spiritual and corporeal possession by a malevolent dead spirit. But it’s really a refined distillation of religio-cultural myth/superstition and attendant rituals, and befitting its subject, is darkly gothic and somewhat inscrutable. Although the characters involved are essentially representative shells, Robbins never reduces them, or the general subject of possession by a non-demonic destructive force, to caricature or derision. This isn’t “The Exorcist, the Ballet”. For all its cerebral spirituality, Dybbuk never loses its sense of reality to those involved, or its humanity to those privileged to see it. In order to understand Dybbuk as a piece of ballet theater, one needs to know something of the underlying religio-cultural belief, and the specific story — a play by S. Ansky (The Dybbuk) on which Robbins’s ballet is based. Ansky was born in what is now Belarus in the late 19th Century, and died in Warsaw in 1920. In addition to his extensive writing, he is known for his ethnographic research into Jewish communities in what was called the Pale of Settlement, within what was then the Russian Empire. Ansky’s play arose from that ethnographic research, and relates the concept of the dybbuk in the context of a relationship. As explained in the detailed program note, the story created in The Dybbuk tells of a pledge by two male friends that if one eventually fathered a boy and the other a girl, their children would marry. The pledge, within the context of that society, is considered binding, but one of the fathers ignores it (he having been more financially successful than the other), instead arranging a more suitable marriage for his daughter than the poor student son of his former friend. In the meantime, and unknown to anyone but themselves, the son (Chanon) and daughter (Leah) had met and fallen in love. In order to keep Leah for himself, Chanon turns to the Jewish/Chasidic Kabbalah, and in the process of attaining the power that that set of mystical beliefs provide (call it maybe a reverse exorcism), he dies – and becomes a dybbuk. At Leah’s subsequent wedding to her father’s choice of groom, Chanon’s ghost spirit appears to Leah and takes possession of her, claiming her as his rightful bride. Her family demands that the dybbuk be exorcised from their daughter. When that process is complete and the dybbuk expelled, Leah, unable to live without Chanon, dies. Dybbuk distills the play into nine integrated segments. First is a generalized introduction to mid-19th century Chasidic ambiance, titled “In the Holy Place.” This is followed, seamlessly, by a scene that depicts “The Pledge” by the friends (Cameron Dieck and Andrew Scordato) and promptly thereafter introduces their children (Tiler Peck and Joaquin De Luz), visualized as adults; after which three “Angelic Messengers” (a combination Greek chorus and Chasidic Herald Angels) introduce “The Dream,” in which Leah and Chanon fall in love – and then find that their love is not possible. In response, Chanon seeks the “Invocation of the Kabbalah” and dies, but, following a “Maiden’s Dance” at Leah’s wedding, his dybbuk takes ”Possession” of Leah. The attempted “Exorcism” follows, culminating Leah’s corporeal death. Robbins’s genius here is not just in creating a panorama of almost “Chasidic Gothic” superstition and ceremony, but to make it vibrant and comprehensible to viewers willing to make the intellectual and emotional commitment (which, it seemed to me, Saturday’s matinee audience did not want to do). If you wait for Dybbuk to entertain you, you might miss the ballet’s brilliance. You have to open your mind to what Robbins is trying to do to appreciate what he accomplishes. It is lengthy (demanded by Leonard Bernstein’s tumultuous score), but it’s not sleep-inducing unless one tunes it out. Every scene, although they merge seamlessly with no break in the action, has an individual character: the solemnity of the the pledge by the two friends (Cameron Dieck and Andrew Scordato), the organized, passionate frenzy of the men in the “Holy Place” (there wouldn’t have been women); the passionate immediacy of the love Chanon (Joaquin De Luz) and Leah (Tiler Peck) have for each other, the hysteria of the mystical Kabbalah and the subsequent Possession the emergent Exorcism. Every significant participant, even those not individually identified, like at least one of the Angelic Messengers (a terrific Roman Mejia), has an individual character as well. The simple set (by Rouben Ter-Arutunian) emphasizes the austerity and the mysticism of the setting – including projected images of Kabbalistic symbols. I did not think that De Luz was the optimal casting for Chanon. He was too mature-looking; too weathered. As has been happening with increasing frequency of late, I was wrong. De Luz may be less youthful than the role seems to demand, but Chanon as a youth is not the complete role. De Luz was a more than credible Chanon the poor theological student in love, but was perfect for Chanon the dybbuk, at once wild with passion and a ghost on a mission. Peck’s Leah was another matter. Peck is a world-class dancer, able to add incomparable phrasing and shading atop prodigious technique, whether the role is a discernible character or a body in exquisite motion. However, to me the role of Leah demands a more compliant, subservient, obedient, and at the same time deeply complex, personality than Peck communicated. Leah is neither an empty vessel nor a sleepwalker: she’s in love (Peck’s fine with that part of it), but becomes involuntarily (though without objection – not that she had a say in it) possessed by another being, albeit the ghost of one. Of equal — or greater — significance is that Leah is an innocent soul, even while being possessed, but this cannot be transmitted as just having a blank expression, which is what I saw in Peck’s portrayal; there’s a “there” there. And it’s not an “age” thing; it’s a “purity” thing. The role was originated by Patricia McBride, but I did not see her perform it. Instead, somewhat later in its run, I saw it danced by a then member of the corps named Deborah Koolish. The image of her “being there” but at the same time “not being there,” and of being pure innocence transported by the dybbuk from one place in time and space to another with the awareness that it was happening but without the ability or inclination to stop it, is something that I’ve not forgotten in more than forty years: Koolish’s portrayal was that good, and that believable. Based on what I recall of Koolish’s performance, I suspect that the characterization of Leah might have been better served, in this unusual thematic situation, by a dancer with less experience. Be that as it may, in Dybbuk Robbins makes the religio-cultural superstition and ceremony vivid and human. He did the same with Les Noces. But unlike Dybbuk, Les Noces comes across as more emotional than cerebral. in Jerome Robbins’s “Antique Epigraphs”. The Stravinsky score for Les Noces (The Wedding) was intended to be danced. After several versions of the score were reportedly composed beginning in 1913, the composition was completed to Stravinsky’s satisfaction (and Diaghilev’s, to whom the score is dedicated), and the ballet, choreographed by Bronislava Nijinska, premiered in Paris in 1923 with the Ballets Russes. Robbins created his version for American Ballet Theatre in 1965, and restaged it in 1998 for NYCB shortly before his death. 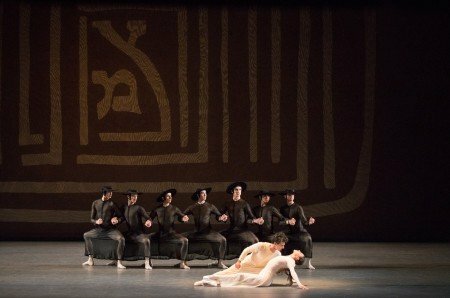 According to the NYCB website note, Stravinsky’s score has its roots in Jewish folklore (that might explain why I see it as related to Dybbuk). But even if that’s the score’s derivation, as Stravinsky develops it, it’s more generically “folk.” Similarly, although the ballet is, in its way, stylized, the visualization is far different from stylized “wedding” ballets presented in a different context (Balanchine’s Bugaku comes immediately to mind, as, on a much more intimate scale, do the wedding references in Alexei Ratmansky’s Russian Seasons). I saw a recreation of Nijinska’s Les Noces performed by The Joffrey Ballet at City Center in the late 1980s. I don’t recall its nuts and bolts, but I do vividly recall its effect: exciting, stimulating, riveting, fascinating. Robbins’s staging is similar to my recollection of Nijinska’s visualization, and certainly is equal to it in its impact. But as Stravinsky composed it and Nijinska and Robbins choreographed it, Les Noces is far more than a visualization of a folk wedding: it’s a form of survival ritual. Nothing was more important than preserving the larger tribal family – and the way to do that was through procreation; and the way to do that was through marriage. In a sense, marriage isn’t only a bond between husband and wife or family and family, it’s a promise to the community — a hope and a prayer that the sexual union will be productive so the tribe can continue, which is why the ritual is both solemn and of almost hysterical importance. That’s also why I see so much kinship between Les Noces and Rite of Spring. The Bride in Les Noces is the Chosen One – she’s not being sacrificed to preserve the tribe (although some might argue that that’s what’s effectively happening), she’s chosen to marry and bear a child to preserve the tribe. Both require elaborate ceremonies to commemorate the momentousness of the occasion, the sound that Stravinsky created for both is cosmically thunderous, and the energy level in the two pieces is the same. The end result, in both pieces (using examples of Rite of Spring based on Vaslav Nijinsky’s original), is monumental theater, and dances that are as powerful and driven as the respective scores. The Les Noces set (by Oliver Smith) is appropriately imposing: think the Capulet crypt in Macmillan’s Romeo and Juliet, but in a more constricted church setting, with religious-based painted (or stained glass) figures overlooking, overseeing – and prompting and monitoring — the stage action. The staging is equally imposing (as Stravinsky intended) – with five singers, a 32 person chorus (Musica Sacra), four pianists, and six percussionists spread upstage, all led by NYCB’s Musical Director Andrew Litton. The sound produced is galvanizing – as is the action on stage. Initially, The Bride is presented by her parents; the Groom by his, in excruciating drama and solemnity. The Bride is prepared (including the famous ritual unbraiding of her hair), with her near frozen fear of losing her virginity, leaving home, and satisfying her community’s expectation vividly communicated. Then the ceremony takes place, integrated with the boisterous wedding feast during which the pair’s (particularly the Bride’s) obligation to mate and procreate drives everything. After the marital bed is warmed by an experienced couple (part of the folk tradition – to enhance the likelihood of fertility), the bride and groom consummate their marriage in a stylized sexual coupling with the entire village gathered outside the marital chamber to ensure that the mating takes place (analogous to court nobility/clergy listening outside the king’s bedroom to verify that that marriage has been consummated). The cast in every respect was exemplary. Unity Phelan and an especially protective but compellingly sympathetic Russell Janzen as the Bride’s parents; Savannah Lowery and a determined Zachary Catazaro as the Groom’s parents; and Ashley Hod and Sean Suozzi the Matchmakers. The 18 member “friends and guests” flowed through every corner of the stage not already occupied by singers and musicians. Andres Zuniga, only a company apprentice, was very fine as the Groom – a combination of young man who knows his obligations and a terrified puppy. But the dance’s centerpiece was Indiana Woodward’s Bride. Although she had less dancing than others, every move she made, every breath she took, every emotional and physical expression, was extraordinarily compelling, with “character” projected from every pore. One could not take one’s eyes off her — not just because she was the event’s focus, but because she was so dominating. The Goldberg Variations, which preceded Les Noces on the May 12 program, is an unbelievably complex moving tapestry. When NYCB revived it in 2015, I wrote that there are ballet masterpieces, and then there are ballet masterpieces that are monumental. The Goldberg Variations is in the latter category – not so much because it’s long (which it is), but because it’s is so remarkable. There are things that many consider to be essential to do in a lifetime: seeing The Goldberg Variations, at least once, must be one of them. The ballet is divided into an introductory theme, an initial set of variations, a distinct second set of variations, and then a concluding synthesis. It opens with a couple, Miriam Miller and Aaron Sanz, costumed in baroque outfits (all the costumes are by Joe Eula), dancing reverentially, in baroque style, to Bach’s theme. 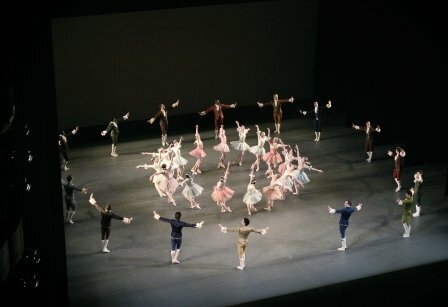 As they yield the stage, the dancers in Part I of the Variations replace them, dressed in contemporary-looking ballet costumes. The six lead dancers in Part I — Emilie Gerrity, Lauren Lovette, Daniel Applebaum, Joseph Gordon, Anthony Huxley, and Taylor Stanley — liberally mixed with the supporting 6/6 corps, then execute Robbins’s contemporary choreography to Bach’s baroque melodies and harmonies. And each variation (or in some cases each separate segment within the variation) ends with a reverential bow by the dancers to each other or to those who simply stand on stage and watch, acknowledging them and thanking them for the privilege of having danced for them. As in 2015, I particularly enjoyed Lovette’s turn oozing her blend of sensuality and innocence in a solo demonstration in front of a semi-circle of six relaxing male dancers who are not so much ogling her as letting her aura wash over them. Then the cast in Part II of the Variations replaces the Part I cast. The difference between the two sections, aside from costuming, is that the six leads in Part II are presented as couples: Sterling Hyltin and Jared Angle, Sara Mearns and Tyler Angle, and Ashley Bouder and Andrew Veyette. Each pair is assigned a separate, lengthy pas de deux, which each pair performed magnificently. Following their pas de deux, when each pair subsequently returns to the stage, having changed their costumes into something that looked more ‘baroque’ – as if the baroque costumes of the “theme” pair and the contemporary costumes of the Part I dancers had merged. The supporting corps (12/8 in Part II) did the same. In the final segment, Robbins pulls it all together. The cast from Part I joins that from Part II, with all now dressed in the more baroque-like costumes, and ultimately they all retreat around the stage perimeter as the original “theme” couple, Miller and Sanz, return, now wearing contemporary costumes matching those of the Part I dancers. 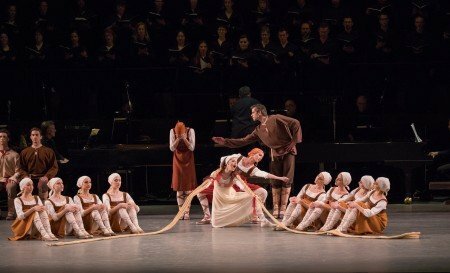 They repeat the initial theme, and the piece ends with mutual respect and acknowledgment – “reverence” – from the baroque couple to each other, from the contemporary dancers to the baroque ones, from one period to another, from one choreographer to one composer, and from one cast to its choreographer. Had I had the opportunity, I would have done the same. Bracketing Dybbuk on the May 5 program were Fancy Free and West Side Story Suite. Both are familiar Robbins pieces. Fancy Free, his breakthrough ballet, premiered in 1944 with ABT’s predecessor company, at the Met. It was joyously received then, and hasn’t stopped being joyously viewed since. There aren’t many ballets that one might consider iconic, and universally recognizable, beyond the Petipa classics, but Fancy Free is one of them. It received the usual strong performances from Daniel Ulbricht (who remains fresh in the role even after dancing it seemingly since he joined the company nearly 17 years ago), Joseph Gordon, Suozzi, Sterling Hyltin (always spot on, and particularly so in this role), Mary Elizabeth Sell, and Miller as the 1940s version of a siren. West Side Story Suite, which premiered in 1995, is a restaging of a component of the 1989 presentation Jerome Robbins’ Broadway, which itself, of course, was a condensation and reconstruction of themes from several of Robbins’s Broadway choreography, including West Side Story, which premiered on Broadway in 1957, and was released on film in 1961. In every form it which it’s been performed, West Side Story has been not only loved, but cherished (much like its source, Romeo and Juliet). It’s what the May 5 matinee audience came to see – applause began even before the curtain rose, and it received a rare NYCB audience standing ovation when it ended. 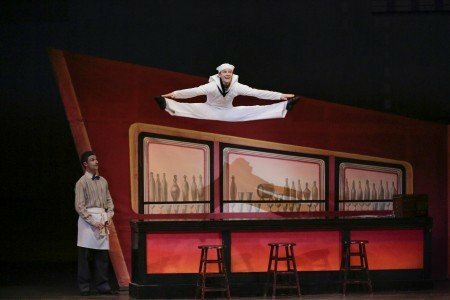 There are no surprises here – and as an example of Robbins on Broadway, it’s perfect (and it’s positioning on the program balanced Fancy Free, which had the opposite trajectory, having been subsequently expanded to a Broadway show and subsequent film: On The Town). At this performance, Chase Finlay was a compelling Tony, Mimi Staker a commendable Maria, Andrew Veyette’s as Riff (leader of the Jets) delivered his usual intensity (and singing voice), and Georgina Pazcoguin brought the house down as Anita, as she’s done since she first assayed the role (ably commented by Woodward as her friend Rosalia). But to me, the piece’s highlight was Justin Peck’s Bernardo (leader of the Sharks). Some forget that Peck is company soloist as well as its Resident Choreographer, and he was brutally masterful in this role, dominating most every scene in which he appeared. None of the four pieces on the third Robbins 100 program that I saw demand extensive discussion – as was the case with Dybbuk, Les Noces, and The Goldberg Variations. But that doesn’t mean that they’re insignificant. On the contrary, at least three of the four, to me, are masterpieces. They’re just less unfamiliar. The one that isn’t a masterpiece, to me, is In G Major – not because it’s deficient in some way (it’s not), but because, to me, it’s not sufficiently significant. Preceded at this performance by an intriguing and enlightening (and entertaining) “See the Music” presentation by Litton and the NYCB Orchestra, In G Major takes the Ravel score (Piano Concerto in G Major) and creates a fun ballet to it. It might have been more purely classical-looking (with jazzy overtones from the score) had it remained in its original form (it premiered at NYCB’s 1975 Ravel Festival), but when it was subsequently staged by Paris Opera Ballet, the name of the dance was changed to “El Sol,” and sets and costumes designed by Erte replaced the originals. Consequently, although the choreography didn’t change, the emphasis did – converting an abstract ballet with no particular time or place (beyond a hint of jazzy contemporary) into an abstract ballet that incorporates the mood of a sundrenched beach (maybe in the South of France): it now looks like a precursor to Justin Peck’s 2013 Paz de la Jolla. There’s nothing wrong with a beach blanket ballet, but the different focus limits it, and aberrations stand out. While the 6/6 corps could have been playing in the sand, the featured couple, Maria Kowroski and Tyler Angle, looked like visitors from a different ballet. As much as I’ve appreciated Kowroski’s marvelous recent performance seasons, that wasn’t the case here. She didn’t do anything incorrectly (on the contrary, both she and Angle executed flawlessly), but in context she looked too Blanchinesque; too austere; too mature — although I suppose one might place the duet on a different part of the beach (the French equivalent of a country club perhaps) to make “El Sol” work thematically, but that’s a mental effort that the audience shouldn’t be required to make. Susan Walters handled the piano solos with her usual musical panache. Robbins’s Afternoon of a Faun, which premiered in 1953, transports Debussy’s musicalization of a forest-glade encounter between a faun and a passing parade of nymphs, one of whom in particular arouses the faun’s interest, to a ballet studio in which a sole male dancer preens, only to be distracted by an equally self-absorbed ballerina. The piece is as memorable, engrossing, and sensual, today as it must have been when it premiered – and Hyltin and Finlay (who debuted in the role earlier in the run) delivered every understated nuance, every sense of attraction and distance, with crystalline clarity. The piece is rarely absent from NYCB’s active repertory for too long; the next time it returns, it’s a must see. Antique Epigraphs, on the other hand, is a rare presence in the company’s seasonal repertory. Hopefully that will now change. This is an exquisite ballet that takes accompanying Debussy music — Six epigraphes antiques and Syrinx for solo flute (the latter hauntingly played by Scott Kemsley) – and uses it to quietly and subtly unearth and explore relationships among women in ancient Greece. To accomplish this, Robbins uses a stereotypical image of a Greek frieze that features women in static position as points of beginning and ending to illustrate what might really have been happening surreptitiously in the male-dominated ancient Greek environment before the women were memorialized as frozen objects — and, by extension, what might be happening beneath male radar under similar circumstances today. Emilie Gerrity, Savannah Lowery, Ashley Laracey, and Unity Phelan led the 8 woman cast. All excelled — but I saw the ballet’s premiere, with a cast that included Helene Alexopoulos, and no ballerina has done Greek goddess better, and it’s likely that none ever will. If there’s a greater comic ballet than The Concert, I haven’t seen it, and have never heard of it. I suspect anyone reading this review is familiar with it, so I’ll avoid going into detail. Suffice it to say that it’s about as far from a one-belly-laugh ballet as one can get (they just keep on coming), but it’s far more than that. Within all this comedy are insights into foibles that we all see and know about, but that are generally overlooked. It’s Robbins at his wittiest. The cast, led by Lovette, Veyette, and Meaghan Dutton-O’Hara, were all expertly hilarious (and Sell deserves accolades for her comic timing as well – as does pianist Elaine Chelton). If The Concert isn’t on your bucket list, it should be. If you’ve already seen it, even as recently as the past week, given the pace of current events you probably need a booster shot by now. I regret being unable to see the other two Robbins programs, in particular Fanfare (which I’ve never seen), Other Dances (with De Luz and Tiler Peck), and Dances at a Gathering (always a joy to see). Some other time. But what I was able to see in this Centennial Celebration was a representative sampling of Robbins at this best. I’m at a loss as to why certain Robbins pieces were not included in the celebration (e.g., New York Export: Opus Jazz, which is scheduled next year, I’m Old Fashioned, and Watermill, which I haven’t seen in decades), or why it was limited to three weeks (based on those performances I attended, ticket sales seemed to have been robust). Be that as it may, the dances sufficiently celebrated this great, and distinctive, choreographer – and had I been only able to see Dybbuk, Les Noces, and The Goldberg Variations, it would have been enough. In any event, beginning this week, it’s back to Balanchine.